A 20th-century literary and artistic movement that attempts to express the workings of the subconscious and is characterized by fantastic imagery and incongruous juxtaposition of subject matter. Literature or art produced in this style. I had the opportunity today to listen to Malcom Gladwell while at the AHIP annual Institute in Las Vegas. I was really impacted by Malcom’s Tipping Point, not just for the introduction of the catchy phrase, but for helping me grok ideas can become epidemic. Malcom is a fantastic speaker – warm, engaging, and funny (I mean, how can you not enjoy listening to a guy who can get away with hair like this?). Malcom’s style is to introduce several real life and understandable examples, and bring them into context to explain a concept. Today’s keynote was no different. Malcom began his talk with two recent health care examples: A friend who had recently seen Michael Moore’s abrasive critique of the healthcare system with the proposed cure being a single payer system and attending a recent conference where the PHR was esteemed as the healthcare panacea. Malcom shared that both of these experiences had effected him enough that he changed his talk from describing the Healthcare Tipping Point to preparing his remarks around Evolving Innovation Styles for Complex Problems. He began by introducing two of the greatest innovators from the world of fine art. Pablo Picasso was seen as a genius, who was able to bring give life to the cubist, neoclassism, and surrealism movements in sudden and often dramatic fashion. Most of Picasso’s greatest works were completed prior to his 30’s Paul Cézanne, on the other hand, had a markedly different track with constant, incremental, and iterative development. His artwork was a cumulative expression of a lifetime of experimentation. To bring this together, Malcom introduced some studies which showed the relative value of various artist works at different stages of their life. Picasso’s most famous (and valuable) works produced in his 20’s at 4X more than that produced in his 50-60’s. Contrast that with Cézanne, whose work produced in his 20’s was valued at 4X less than his works produced in his 50-60’s. Pablo Picasso, Mandolin and Guitar, 1924. A second comparison was that of two of the greatest rock bands of the 70’s. The Eagles were formed in 1971, and found immediate success with their first album and went on to produced several others culminating with Hotel California in 1976. Conversely, Fleetwood Mac had been formed nearly 10 years earlier and took a painful meandering and aimless journey through England, through the acid haze of the 60’s, 15 different bandmembers, and 15 different albums before producing their masterpiece, Rumors, one of the most successful albums of all time. 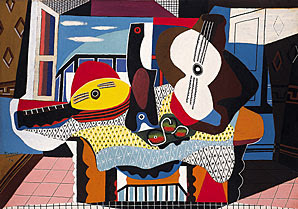 This first (Picasso) style of innovation was described as being “Conceptual Innovation” meaning the innovator began with the end in mind, had a clear vision of what they wanted to accomplish, and went out an executed. The second (Cézanne) style of innovation was described as being “Experimental Innovation” whereby the innovator continual works through a hypothesis, refining methods and means, and continually improving until the masterpiece is achieved. Malcom’s point was that for specific types of problems – particularly very large, complex, and multi-stakeholder issues – the Picasso style may not be appropriate and that we should consider a Cézanne style framework and time horizon. Some problems just require solutions with more experimentation, additional experience, collaborative intelligence, and the natural smoothing of time. Health Care reform certainly fits in that bucket. versation he had with a VC who said that he would never invest in the energy sector because he could not get an investment in his prescribed 6 year time horizon. However, the complexity of creating an alternative hydrogen energy source within that narrow 6 year horizon precludes necessary investment that will yield the desired result over time. Bringing it back to Iraq, Malcom’s point was that the American were told (and naively believed) that bringing democracy and cultural values of freedom to Iraq was going to be a Picasso problem, when really, it was and is a Cézannian problem of epic financial, political, and social implications. The Cézanne approach would of necessity indicate that the problem will require continual refining, altering strategies, and ultimately working variations of political, military, and social experimentation until we collective find a solution that resolves the crisis. In terms of health care technology, the reason why Web 2.0 is so relevant for healthcare is that it serves as a model for how to accelerate the Cézannian process. Web 2.0 has been so successful is that it engages the consumer or end user in experimentation that was never before been possible. The ability to leverage content, “remix” in the form of mashups that are relevant to the individual person, and then marry this with the epidemic style viral marketing of social networking is an example of this style of innovation. It also highlights the technologies ability to compress innovation time from years to months. My thoughts about the power of combining Web 2.0 within a healthcare context are well known. In terms of the health care delivery, I don’t believe there can culturally be a “big bang” solution that meets the current challenges. What we need is a Cézanne style time frame expectation (which we need to compress with technology) complimented with Cézanne style technology, social, and political experimentation. We are beginning to see some of these experiments in Massachusetts and California, in the consumer driven movement, and with alternative and innovative insurance products. We need more and it needs to be driven by the people most affected and most impacted by all these changes – employers and consumers. So while we all anticipate the mythical healthcare tipping point, it won’t happen in the blink of an eye, but will require the incongruous juxtaposition of Picasso thinking over a Cezanne timeframe.